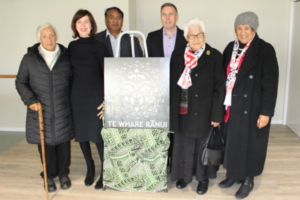 Mary Potter Hospice has cemented its commitment to the Porirua and North Wellington communities with the completion of the first phase of a community hospice facility in Rānui Heights. Te Whare Rānui was today named by Ngāti Toa and blessed by its chairman Taku Parai. It means literally “A house where the sun always shines on it”, which is a wonderful symbol of warmth and brightness for people going through a very difficult time. The area was known for its good planting and harvesting. “Our community feels that the relationship that we have with Mary Potter Hospice is very important. The services they give makes an important contribution to our people at a vulnerable time in their lives. The chance to receive services close to home and whānau means so much to our people,” said Dr Parai. Also speaking at the blessing was the incoming chair of Mary Potter Hospice Andrea McCance. The building was purchased by Mary Potter Hospice from Healthcare of NZ and most of it is still in use by them. As their residents move into community care, Mary Potter Hospice will renovate the remainder of the complex. Initially the building will be a base for Hospice community staff to go out and visit patients and their whānau, and for doctors’ clinics and counselling. By early 2020, when the remainder is renovated, it will provide space for patient day services, education courses, bereavement programmes for children and adults, and other therapies. The Hospice was established exactly 40 years ago to provide free of charge palliative care to the people of Wellington, Porirua and Kapiti. It costs around $13 million a year to run the Hospice. The government pays around half, and the remainder is funded through second hand shops, fundraising and other activities. Mary Potter Hospice’s care is holistic, considering a person’s physical, emotional, social, cultural and spiritual needs, and supporting their families, whānau and carers too. Anyone living with a life limiting condition – e.g. heart failure, motor neurone disease, or cancer – can access and benefit from hospice services. Hospices aim to help people make the most of their lives; to live every moment in whatever way is important to them.